Here's a video overview of Aputure's latest VS-3 7" IPS LCD HDMI Monitor . You'll notice we have this hooked up to the BlackMagic Pocket Cinema Camera [#BMPCC], and we've confirmed that it can display the 10bit uncompressed 4:2:2 output. One main concern for affordable monitors is always color accuracy. This is a highly subjective subject, but Aputure claims the colors on these monitors are pre-calibrated before shipping out from the factory. I'm not saying it's going to look as good as a SmallHD AC7, but keep in mind the Aputure VS-3 is a sub $400 dollar display that offers many advanced overlays the AC7 does not - (audio meters, etc.). The monitor offers an HDMI pass through so you can still send the signal to another monitor or wireless video transmitter. Aputure's V-Screen VS-3 is an ultra-thin 7” IPS monitor featuring a crystal clear WSVGA display, wide viewing angle, low power consumption, multiple aspect ratios, and includes essential functions such as Volume Bar, PEAK, False Color Display, Zebra Marking, Brightness Histogram, etc. It supports multiple signal inputs, including HDMI/YPbPr/AV (Audio/L/R). It also has a universal mount, double power supply, and sunhood to help you to shoot anywhere. Additional Information, availability, and pricing for the Aputure V-Screen VS-3 7" IPS LCD HDMI Monitor can be found via eBay (click here). Posted in dslr video, Equipment Reviews, HDMI LCD Monitor. Tags: Aputure HDMI Monitor, Aputure V-Screen, Aputure VS-3, BMPCC LCD Monitor, Loop Through, Pass Through on December 10, 2013 by Emm. as far as you know will this work on a Panasonic HC-V770 Camcorder? So it's Nov 2014. Any updates on monitors? Anything new and improved you'd recommend now instead of this monitor or is it still your top pick in this price range? @Herman - Thanks for sharing, but after the first release they made corrections shortly after. I think you may just have an early one. They also have another version of the screen with added features that will be released soon. I have a VS-3 and I made it work with my Panasonic GH2. Also, I have it working with GH4... in fact, it handles 1080@23.976 and 1080@24 quite well (the 24Hz is the DCI 4K mode for GH4). Note that out of the box the unit will not support GH2/GH3/GH4 as their HDMI input is set to recognize only Canon/Nikon. It requires a simple pencil soft mod on a resistor to solve this problem. Just a few minutes of your time, a pencil, and a multimeter will get you up and running. Is your camera Panasonic GH2, GH3? Because the output of these cameras are 720P, 24/25/30fps, however, our monitor only support 720P,50/60fps, Thus, the problem you've met happens. Btw I tried ALL output options from the GH3 and nothing worked. Ended up getting a Marshall. Thanks Emm. I will standby. Cheers. @Danny - Interesting you would ask about MustHD Monitors. I happen to have a couple on my desk I have to open up very soon. 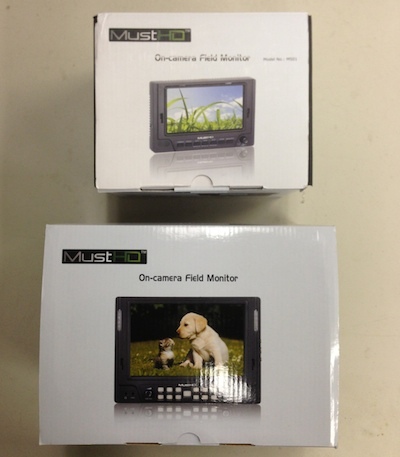 http://www.camotionllc.com/ may be carrying these monitors so i'm taking a look at these things. Do you have any opinion on the MustHD monitors? The resolution seems descent and it has HDMI loop through. Also trying to avoid Lilliput. I am looking for a 7inch for the field and trying to stay under $400. Any feedback is appreciated. @Stuart - What do you mean that it doesn't work with the GH3? The framerates and resolutions look like they are supported. What happened when you attempted to use it? I bought the monitor and the feature set is impressive. Unfortunately it DOES NOT WORK with the PANASONIC GH3. I wish they would have stated that when I bought it. I'm sending it back. Great post. but how accurate are the focus peaking and zebras? The Ikan D5w its having RGB, Scopes & Waveform at only 745$ compared to others that are 4 times more expensive. I live in Romania and our budget its not so big. 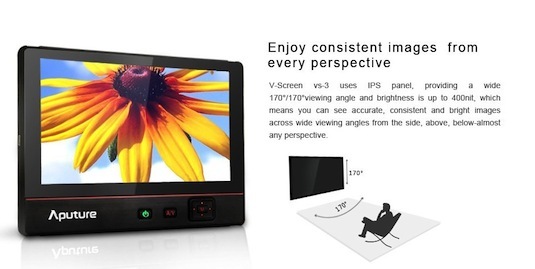 It will be usefull to see your great opinion about this monitor Emm. Thank you again for you effort to help us choose the right tools. I just find the Ikan D5W 5.6 inch that seems to be perfect for DSLR shooter like I am. Can you please make a review & comparison with your SmallHD Dp6? Keep this great job & thank you so much Emm! Can you correct this article - the small HD AC7 DOES include peaking and false color not to mention a MUCH better native resolution. Id much rather spend the extra $200 on the AC7 and get a quality product from a tried and true manufacturer. @guest - Not on the #BMPCC. I have not tried other cameras. @Tulio - Just FYI, i've already been through several monitors that could not display the feed from a BlackMagic Pocket Cinema Camera. Resolution is great, features are wonderful, but also double check whatever monitor you purchase is compatible with your camera. @Kevin - I will have to double check this, but if I remember correctly, the pass through is just a simple pass through with no overlays. Most monitors just allow an unaltered feed on the HDMI output. It doesn't matter the size of the screen, the resolution is too low. Thre are better offerings out there. this would by my first field monitor and i was wondering if you would recomend this product for use with a 600D and 60D? how does it stack up against monitors of the same price range? also do you know if the 600D will output sound through hdmi into the monitor for audio monitoring? When using the HDMI pass-through functionality, does the overlay (peaking, zebras, etc.) get passed through or only the original signal? @Dave - When you've got your face up to the DP4 with the Loupe to magnify it, it's usable as a monitor, but many times people want to see what you're shooting, how you're framing, etc. A larger monitor would be better than the DP4 in those situations. That's a lot of features at that price point, def consider it to use with BMPCC. Is the SmallHD DP4 EVF big enough to use as a monitor on it's own or would it be better to get something this size?